Holy Moly! Check out the HUGE list of Beatle things going on this coming week. Tribute bands, shows, and more all crammed into 7 short days. We are trying hard to get bands to keep the list up-to-date by sending us their gig lists, but if you know of a band we are missing, email us and we will be sure to add their gigs. Here's a snapshot of what's scheduled for the next 7 days. Link to the full What's On Page. Paul has been announcing more tour dates in South America and now Japan. The list below is from our What's On Page. You can use the green button on that page to filter the list to see just Paul's concerts, or just events in your country, or even a single date. It's pretty handy. Today the BBFC is announcing a new feature that we have added to the website. On the new "maps" tab you will find an interactive map of London with Beatles related locations pinned. The pins are categorized and the legend explains each pin type. If you click on a pin, an information box will pop up and give you more details about the significance of the site. We are adding new pins weekly so check back weekly. Remember when using the map you can zoom in and out, click and drag to see other areas and don't forget to click on the pins to see more information. Below is a peek at what it looks like, but you can visit the page and try it yourself here. Which of these events are you going to? Wow! Have you checked the What's On calendar for this week? 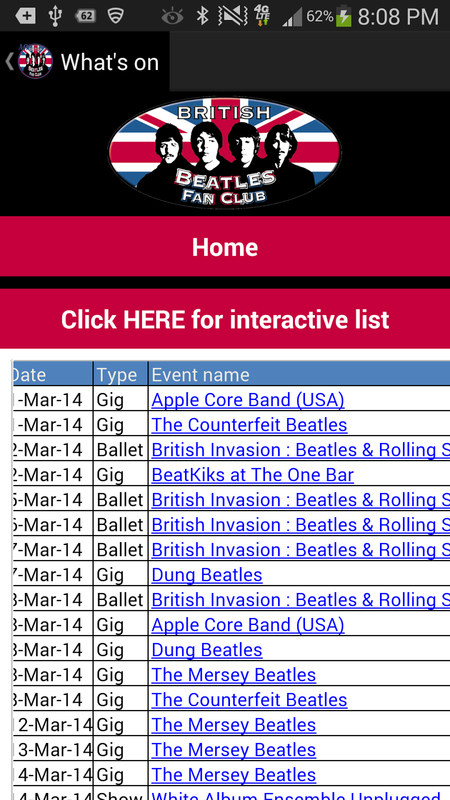 That is a long list of Beatles stuff happening. Don't forget to check our new What's On page to see what's scheduled in your neck of the woods. We have already unearthed more than 500 events happening this year so there is bound to be something going on near you. Don't forget to email us to let us know about events we've missed. We want to keep it up-to-date. Here's a snapshot of what's scheduled for the next 7 days. Link to the full What's On Page. What's on next week? Check it out! Have you made your plans to do anything "Beatle-y" this coming week? Don't forget to check our new What's On page to see what's scheduled in your neck of the woods. All You Need is Love ... and Everything Else for a Wedding at the Hard Day's Night Hotel! For Beatle fans planning a wedding, or a party to celebrate any special event, surely there is no better venue than the Hard Days Night Hotel in Liverpool! The Beatles may have claimed that "all you need is love" but anyone planning a wedding or a party will know that it takes much more than that. If you hold your celebration at the Hard Days Night Hotel, though, you can rest assured that the dedicated team of Events Staff will do everything they can to make sure that your day is perfect, so you can relax and enjoy your special day. 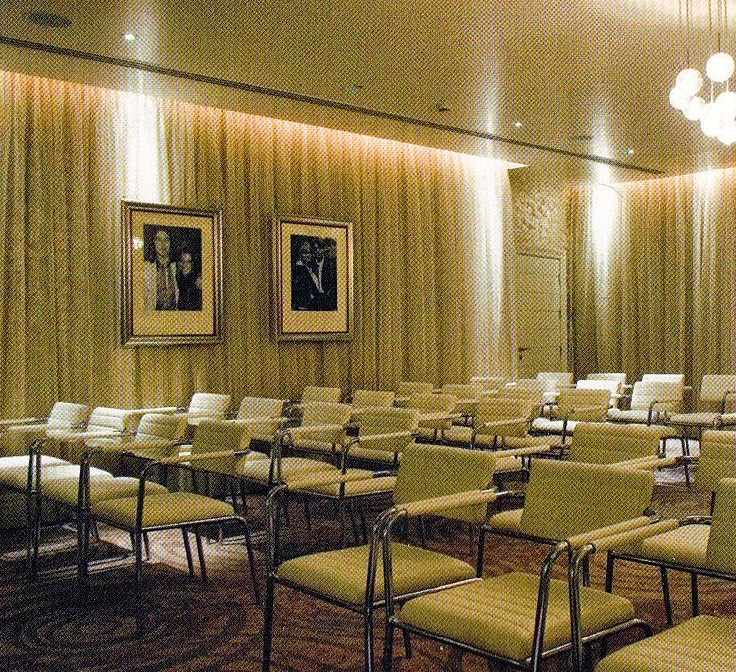 The hotel is set within a classical 1880s building, in the heart of Liverpool, and is the ideal location for a truly memorable event. The Two of Us suite has been designed specifically for those couples who have opted for a civil ceremony rather than a traditional Church Wedding, and provides the perfect setting for an exclusive and memorable wedding or civil partnership. The Two of Us suite can accommodate up to 75 guests, and the adjoining suites, including the fabulous Zygmant Suite, provide the ideal setting for the Wedding Breakfast and evening celebrations for up to 180 guests. Various wedding packages are on offer, including the "From Me to You" package, the "All You Need is Love" package and the "Imagine" package. "They Say It's Your Birthday!" The hotel isn't just the perfect setting for weddings though! 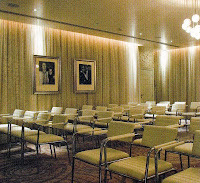 The hotel regularly plays host to all sorts of celebrations, including birthdays, anniversaries, and graduations. Whatever the reason to celebrate, you can be sure that the dedicated staff at the Hard Days Night Hotel will ensure you have a special and memorable day! 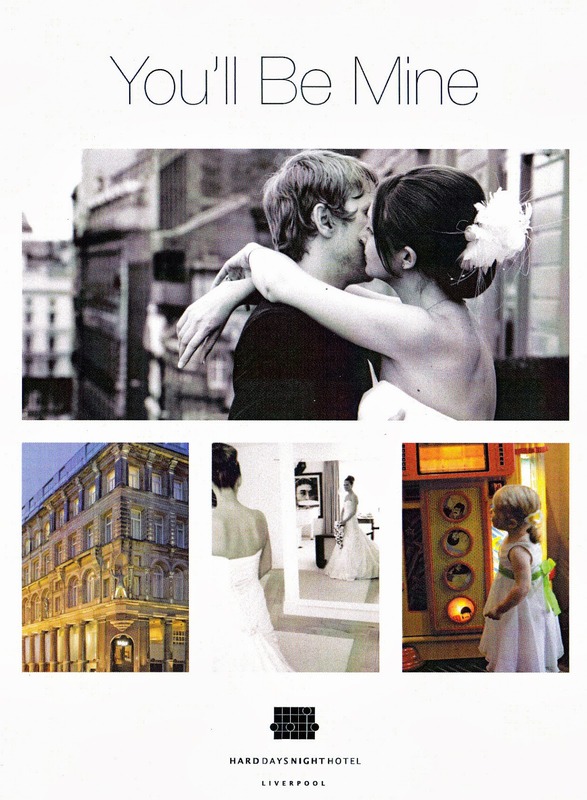 If you're considering a wedding, or other special party, at the Hard Day's Night Hotel then why not attend the Wedding Fayre on Sunday March 16, from 12 - 4pm? Enjoy the Bridal Emporium to view the beautiful Bridal & Groom wear modelled by elegant models. Free entry and goodie bag with gifts from LUSH and Beauty Bazaar for all brides to be! Want a taste of what to expect? Then check out these photos from the Wedding Fayre held on Sunday October 20! The Wedding Fayre gives all those who attend a flavour of how truly fabulous it would be to have a wedding -- or any special party -- at the hotel, and also provides great ideas for dresses, cakes, flowers, decorations and all those other special treats that would make the day truly memorable! 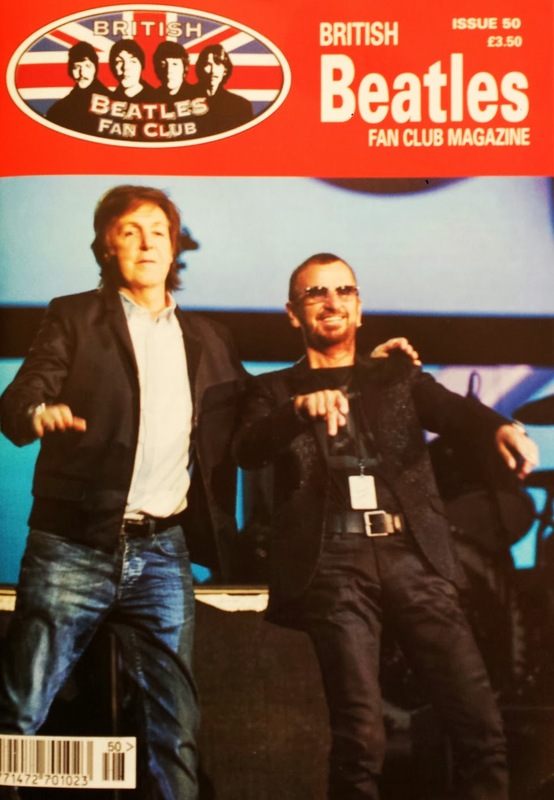 Both Paul and Ringo are hitting the road again with tours. Ringo's tour schedule has already been published and at the moment it just includes North American locations. Paul has only announced one location in Santiago Chile but promises that more stops will be published very soon. Ringo's tour kicks off on June 6 and you can see his dates on our What's On Page or on Ringo's site. Paul's tour starts April 21 and we will be adding his dates to the list as they are announced, but you can also watch for more news on Paul's site. 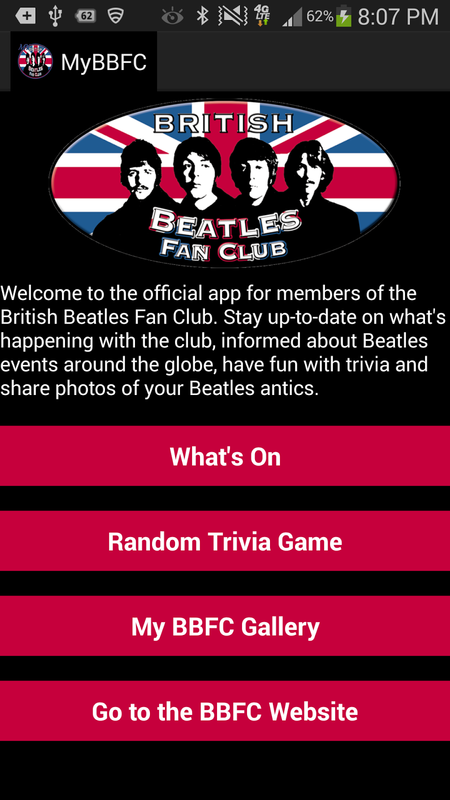 The BBFC now has a great new way for our members who have android devices to keep in touch and up-to-date on What's On in the world of all things Beatles! This is the Beta version of the app and we will be making it even better over time but this first version still has a lot to offer. The What's On button will display the same list of events that can be found on our website. This list is updated daily and currently lists nearly 200 events for 2014 from all over the world. The Random Trivia Game button will display a random and challenging trivia question. Once you've had time to think of your answer, you can click the check answer button to see if you got it right. The My BBFC Gallery button will take you to the gallery page. On this page you can tap the image displayed to go directly to our new Flikr gallery to see photos of our members having Beatle-fun, or better yet, use the upload button to take and upload a photo of yourself having Beatle-fun and email it to us so it can be added to the gallery. The Go to the BBFC Website button will take you directly to the mobile version of our our website so you can read the latest news, click on the events in What's On to find out more details, shop in the shop and more. We are excited to be able to offer this new feature completely free of charge and if you have ideas of features you'd like to see in the future, please email them to us. And if your device isn't an android, we are sorry that it won't work on other devices.